Traditional Swiss recipe to care for heart and circulation. 100% certified organic herbs of: Motherwort, Hawthorn leaves and flowers, St John’s Wort, Lemon Balm, Passionflower. 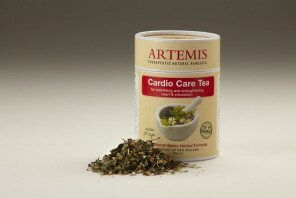 Enjoy 1-3 cups daily as a heart and circulation strengthening drink. For full supportive benefit take 3 cups daily for 6-12 weeks. Can be safely taken longer on a daily basis. Use as directed. If you are on prescription medicines (re: St. John’s Wort) or if symptoms persist, see your health professional. Clinical trials have shown that hawthorn is safe to combine with conventional drugs. Can be taken safely alongside heart medication.